My web design and development services aim to help maximize the potential of your business and branding. I can provide a package for most budgets ranging from small business websites to custom developed intranet/extranet systems that are planned and programmed to fit very specific requirements. My web design service is based on many years experience working within graphics and new media agencies both within New Zealand and overseas. Looking to design a new website? I work closely with you to detail project requirements and develop visuals and suggestions for your new site design. I will ensure your web graphics are coordinated with any other print based materials and create your new site to communicate effectively to your target market in the most appropriate style. My designs are functional with a focus on search performance, usability and clear navigation. 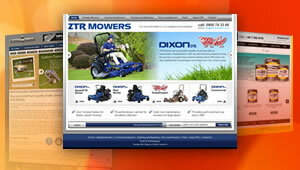 I work within your budget limits to provide a highly functional full featured website. Building a great looking site is not the end of the story. It needs regular attention and analysis to ensure you are exploiting all opportunities and not missing out on potential sales or leads. I offer a free general review of your current site's usability and search performance. There is no-obligation to follow-up on any comments and you will have a valuable and objective insight into your website's strengths along with any areas for improvements. If you are looking to design a new website or improve your current site, please contact me now.